Mr. O'Brien: I've just always wanted you to be strong, be your own man. 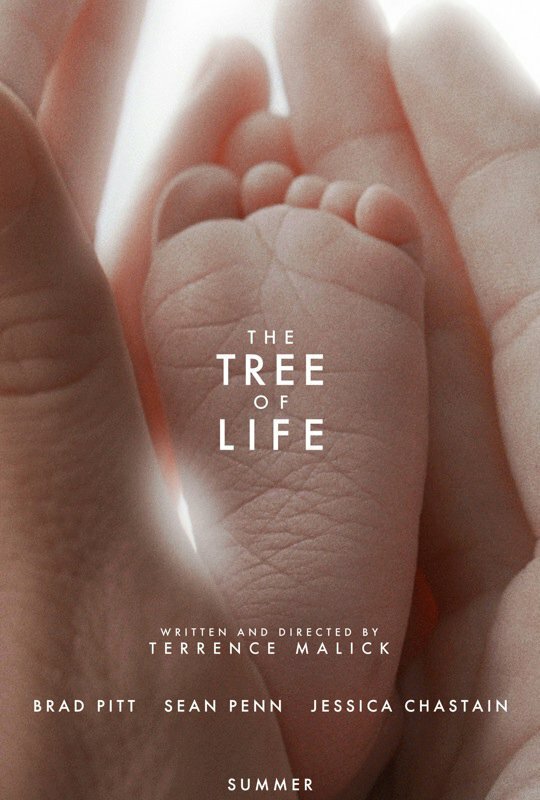 It almost feels daunting to start to try and describe my thoughts on the latest Terrence Malick film, The Tree of Life. I certainly enjoyed the film, but for the purposes of a review, establishing what it is about this deeply meditative film that encompasses many different themes stemming from a personal place for its writer/director certainly presents a challenge. I have read many comparisons of this film to Stanley Kubrick’s 2001: A Space Odyssey, which feels very appropriate in many ways. Tree of Life certainly manages to encompass a scope that feels similar to Kubrick’s sci-fi classic. As a Malick film, this certainly feels like a deeply personal project that was somehow able to get off the ground and be made by a willing enough studio. I feel that my prose in this opening paragraph alone is already somewhat scattershot, as I do have many more things to say about the film. Basically, this has all of the elements of a very ambitious and deep film, which has been beautifully realized; however, the line of pretension is one that this film borders on crossing at many points, which does not necessarily act as a negative against the film for me, but will certainly test audiences that are not quite sure what to expect. The Tree of Life is slow and minimal in a sense, but also reaches many moments of profundity, which speaks well for everyone involved in its making. 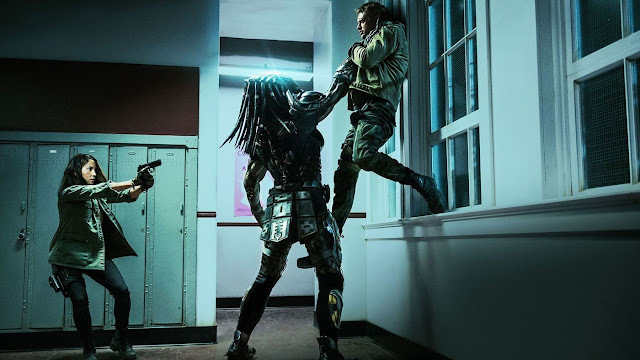 While the narrative of the film is only communicated in the sparsest of ways, there are a few story elements that can basically be used to describe the basic plot of this film. The bulk of the film is set in the Midwest, during the 1950s. 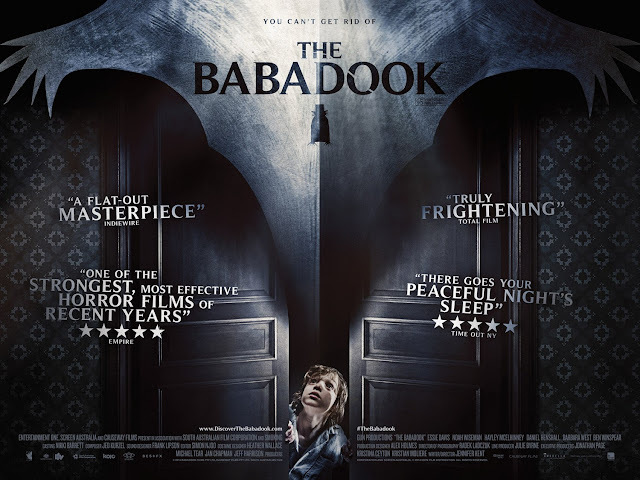 Jack (Hunter McCracken), an eleven-year old boy, the oldest of three brothers, begins to develop his outlook on life, as he witnesses things that life will have to offer him. Guiding him through this time that is shaping his life are his parents. 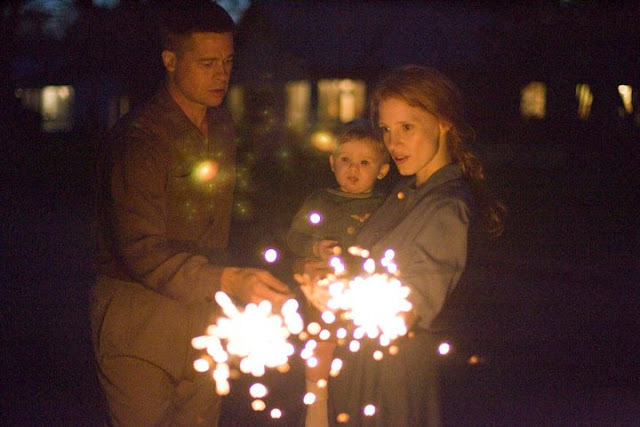 Jack’s mother, played by Jessica Chastain, is very loving and merciful; while Jack’s father, played by Brad Pitt, is a very stern man, who intends to teach his sons lessons and manners regarding the hardships of the world. The film is framed around the story of an adult Jack, played by Sean Penn, who, upon learning news regarding a family member, has basically found himself to have grown up as a lost soul, searching for further meaning in life. He takes his own mind into an odyssey of self discovery, as we watch various scenes from his childhood taking place. 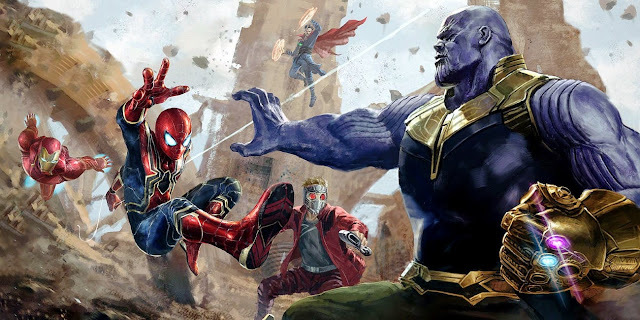 Adding even more to this story, there is a thematically connected element that involves the evolution of the world as a whole, as the film manages to involve the creation of the world and early stages of life within the realms of the main story as well. 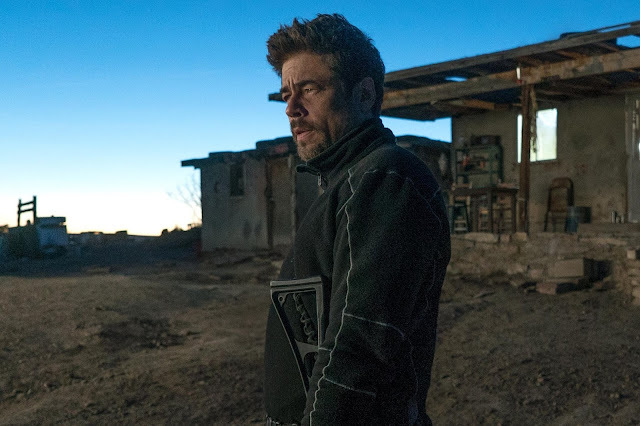 There is certainly a broad scope present in this film, which lends itself to a purposefully intended atmosphere that would suggest one’s self discovery, if one were to hope best to involve themselves in the spirit of the narrative. And this film also has dinosaurs. 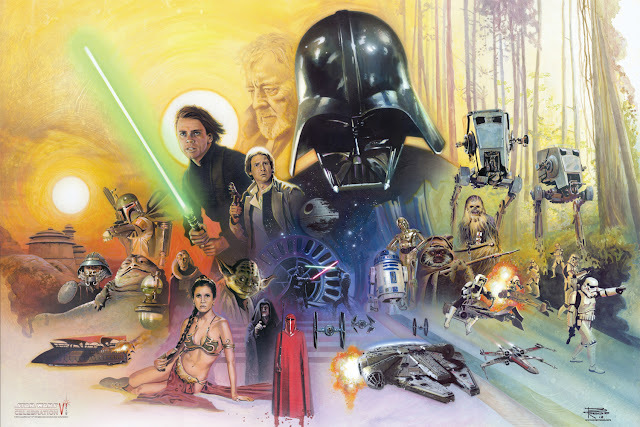 I feel I could layout the entirety of what happens in this film and still have been able not to spoil anything. The Tree of Life does not present a traditional narrative by any means. This is very much a film that relies on observation and discovery through its cinematography. Dialogue is never something used as a tool to explain what is occurring on screen. 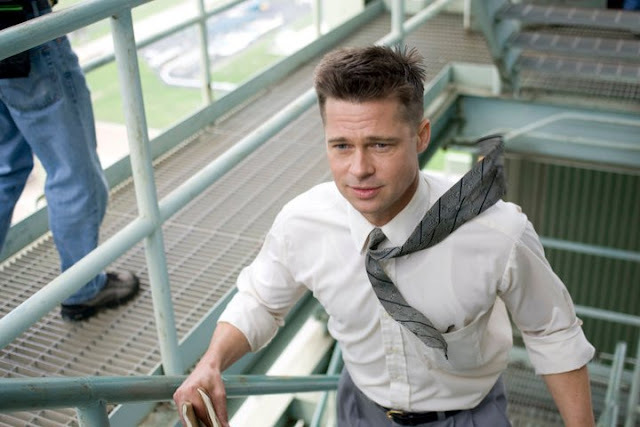 Understanding of what is occurring onscreen, why certain scenes have taken place, and what various outcomes mean for each of the characters are not points in the film that are aided by title cards or traditional filmmaking techniques. This is a film that plants the viewer in the scenery along with the camera and takes them for a very quiet ride through beautifully shot images of life. I can easily understand how many have already made up their mind about whether or not to see this film, because it does not lend itself to everyone, which does not make someone right or wrong for thinking that way. The Tree of Life is not traditional in any sense and certainly does not beg to be explored by everyone, just those who are intrigued by the style or subject matter and have patience. This film easily exemplifies the style of Malick as a filmmaker. His fifth film in a 30+ year career as a filmmaker, The Tree of Life once again shows how Malick’s use of nature and period settings lends itself to stunning, cinematic visuals. With the aid of cinematographer Emmanuel Lubezki, Malick has made a film that could essentially be divided into thousands of great pictures to hang on a wall or use as a computer screensaver. There is a ton of superb imagery, a great use of lighting, and a wonderfully dynamic sense of how to move the camera through all of the scenery presented. The use of score is quite effective too, with composer Alexandre Desplat contributing a great deal in a minimal sense. The Tree of Life certainly provides a soothing atmosphere of sorts, were one to just absorb all of the beautiful shots in this film, not to mention the intriguing use of special effects to capture the broader images that are focused on the earth’s evolution. Jack: Father, Mother. Always you wrestle inside me. Always you will. Despite the way each character is presented through only so much dialogue, there is enough to praise about how well crafted these performances seem to be. I think the two standouts are young Jack and his father. 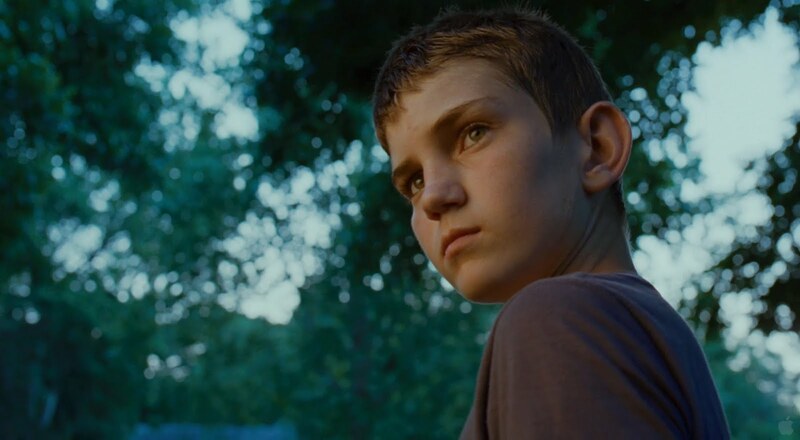 As Jack, newcomer Hunter McCracken is astonishingly good in a fairly challenging role, given that a Malick film has to communicate so much through subtle nuances. Pitting a young actor into a role that requires observation of the loss of innocence is no small task, but it is handled very well. 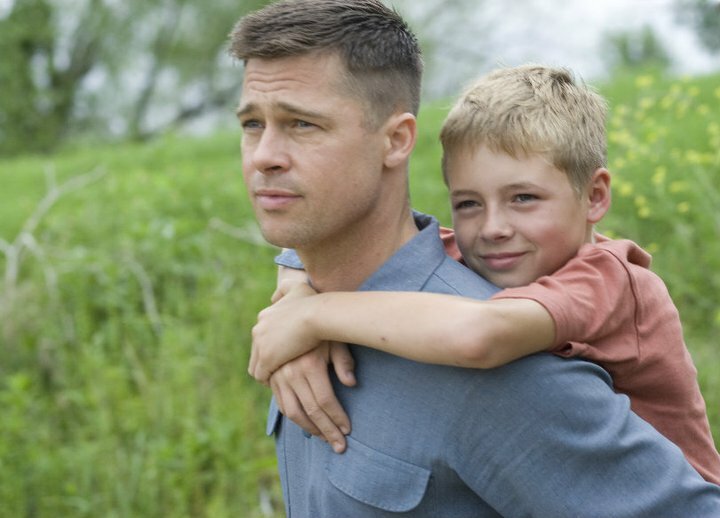 Brad Pitt’s work as the father is incredibly well handled as a man that is not abusive to his family, but agonizingly human. Again, it is all in the way Malick has crafted this film, which has Pitt’s character act in very specific ways that are of a benefit to how this character is supposed to reflect on Jack and the others. The other actors are quite good as well, with Sean Penn showing quite a bit of restraint in his smaller and quieter role and Jessica Chastain having a solid handle on portraying a kind maternal figure, sharing parental duties with her dissimilar husband. With all of the admiration that I can attempt to describe, regarding this film, I must also note the few quarrels I have with it. This is a deeply obscure type of film. As much as I like to use that term as one of its positives, it does also lend itself to reasons why it just can’t be fully embraced by everyone. 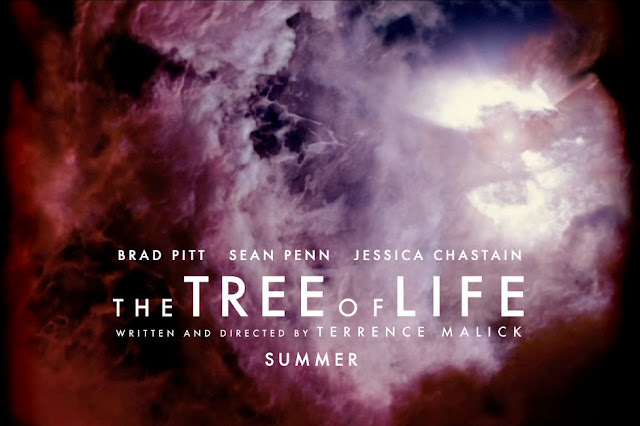 The fact is that The Tree of Life is very much a Malick film, which means it is quite long and includes lots of scenes where one will find and believe nothing to be happening. I am boiling this factor down to a very general sort of criticism, but it would be hard to look past just how much self importance had to be involved in the overall construction of the film. I am certainly not suggesting that this film is screaming out to be labeled as pretentious (plenty of others, including those who walked out during my screening can handle that), but a two and a half hour art film does call into question the various tropes that these types of movies are known for. Regardless of how beautifully crafted this film is, having a handle on being in the right state of mind when viewing this film is certainly essential in order to appreciate all of its positive aspects, over the various ways in which The Tree of Life could be seen as a slow and esoteric mindfuck. It would take a lot to have me want to watch a long, deliberately paced art film more than once in short succession, yet I am quite drawn to what The Tree of Life had to offer and will most likely revisit the film at some point, theatrically. I am even more drawn to it now, having worked out my thoughts over the course of this (amateur) critique. Yes, this is a film that revels in being about big themes, wrapped inside of a film that is all “leaves rustling and stirring music,” but they are some pretty damn beautiful leaves to watch rustling, and did I mention the dinosaurs? Incredibly well crafted and shot, wonderfully nuanced performances, and plenty to take away from the film, let alone converse about with others after the fact, regardless of how much appreciation one would have for it. Terrence Malick may take his time in between releasing films, but damn does he deliver an intriguing experience every time out. Mrs. O'Brien: There are two ways through life: the way of nature, and the way of Grace. You have to choose which one you'll follow.